The next time anyone outside the Giants’ organization sees Odell Beckham Jr. likely will be during warmups at AT&T Stadium Sunday evening, when he gives his sprained left ankle one final and perhaps deciding test. Chances are he will not be 100-percent healthy at that point, which will force the Giants to make a decision. Do they rest their most explosive offensive player for one game — a significant one against the defending division champs — in the hopes of having him healthier for the next 15? Or do they play Beckham at whatever level of health he is at — 75 percent? 80? 90? — and hope he can help them beat the Cowboys without jeopardizing the rest of the year? It’s a decision the Giants have had to face before. In fact, it’s one that altered their history. “I immediately thought back to big 17, Plaxico Burress,” offensive coordinator Mike Sullivan said Thursday when asked about the value of playing stars when they are not at full strength. That scenario was never more clear than in Super Bowl XLII. Burress exacerbated his ankle injury with a slip in the shower during the week before the game but played against the Patriots. Targeted nine times, he made only two catches for 27 yards, but one of them was the winning touchdown with 35 seconds remaining. If the Giants were in the Super Bowl and Beckham were at the same point with his ankle as he is now, he undoubtedly would be playing. Sunday, however, is not at that level of importance. Ben McAdoo has said Beckham’s availability will be based on a medical decision, not anything to do with football. 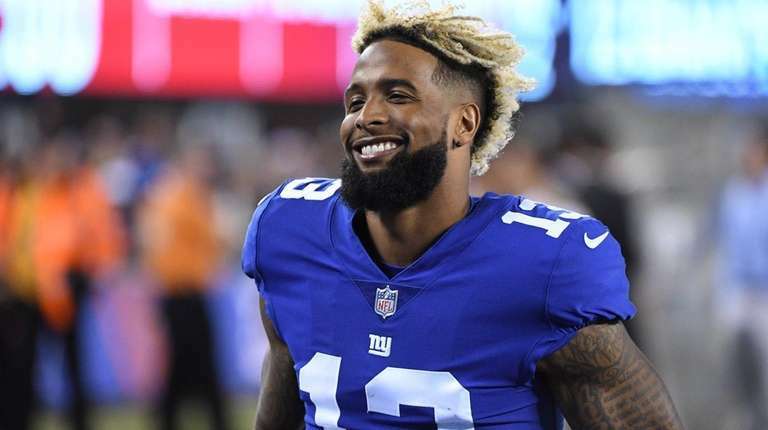 The Giants must declare their inactive players an hour and a half before kickoff, so that gives them until about 7 p.m. to get Beckham in shape for the game. There was one situation in which McAdoo seemed more skittish than Sullivan about having Beckham, or anyone else, play at less than full health. Certainly not one so integral to the team’s success. Beckham did some straight-line running at Thursday’s practice, working off to the side while the rest of the team went through drills. He was not seen doing any cutting. “He is doing everything the trainers ask him to do,” McAdoo said. The Giants will not practice Friday, but that does not mean Beckham cannot work on the field in some capacity. They will have a workout tomorrow before heading to Dallas, another chance for Beckham to advance in his rehab. Both of those opportunities will take place away from the prying eyes of the media. And then it is on to Sunday and the final determination of Beckham’s availability. That said, the Giants would much prefer to have Beckham on the field. It worked out well one other time when the Giants went through a season with a star receiver stung by an injury not severe enough to sideline him but substantial enough to limit him. If a fractional Beckham can provide that kind of result, it might be worth having him play on Sunday.